Hope you had a wonderful weekend. I had so much fun on Saturday night. I went to the Pirates of Emerson’s Haunted Fields. It’s in a empty field and they have 6 different themed haunted houses. Very cool, and it actually was scary! 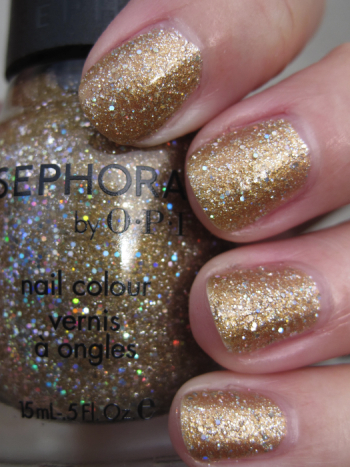 Sephora by OPI has a few new colors out and I have three of them to show you. I apologize in advance for the lack of shimmer in the pics. Turned out to be a pretty grey and dreary weekend, weather-wise, so of course the pics don’t look as nice as normal. I hate the lighting this time of year!! Worth My Weight is a cool gold with loads of regular small gold and holographic glitter. This one is as chunky as it looks, but it’s so awesome. If you use a nice thick top coat, that will take away the rough surface. This was two coats. Absinthe Makes The Heart is a green/grey with different colored micro-glitter. I showed a pic of this on Twitter the other day and people seemed to think it was a black/green, which it definitely isn’t. I think it’s because that pic was taken at night so it looked a lot darker. This is definitely green, no worries about it looking black indoors. And it’s very original also, I don’t own anything like it and love it! This was three coats. 212-Sephora isn’t “new” new, but it is kinda new. It came out a few months ago but was always sold out. 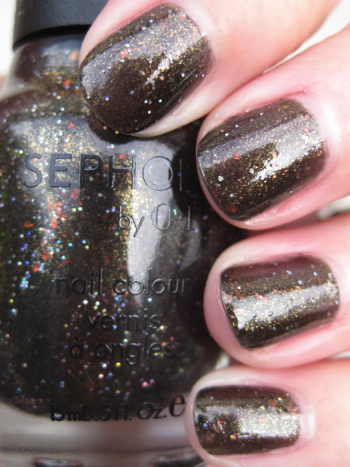 It’s a dark blackened olive brown with small and medium chunks of glitter, holographic glitter and red flake glitter. This is a really cool color, I would get it while you can if you like it because it is limited edition! This was three coats. I really like all three of these and don’t own anything like any of them, which is great! They are all available on Sephora’s website right now for $9.00 each, and today until Nov 2nd, Sephora is having a 20% off sale if you use the code “FF2009” at checkout. Enjoy! gosh darnit i like them all. .-= yaya´s last blog ..Moisturize Me Softly… =-. i think worth my weight could be a dupe for goldmine from claires maybe? i really think i MUST have 212. good post!! I think that OPI always have such clever/ funny names, like in this post, Absinthe makes the heart… So funny. I’m so excited for Ansinthe Makes the Heart! I had my eye on a polish like it ages ago, and when I finally set out to buy it I found out it had been discontinued! I love Worth My Weight too. Of all of these, I think Absinthe Makes The Heart is my fave. .-= Marisol´s last blog ..SoCal visit =-. Inspired by your post, I actually ordered that color from Diamond Cosmetics, and it was the first color that came to mind when I saw this OPI post. Curious to know if I need both of them – they both look fabulous! .-= Feline´s last blog ..Pasta med snabb musselcurry =-. Just order the Absinthe and I have the 212. The first one is all right but I have loads of gold glitters. Thanks for showing these. I saw Absinthe and Worth and I picked up Absinthe, skipped Worth! Never Enough Shoes was on the same display so I picked that up too 🙂 I finally got to order 212 on line, I’ve been waiting forever!!! Every time they would send the email that it was back in stock I’d be too late to order it 🙂 Thanks for the swatches, they all look great on you! .-= Judy´s last blog ..New: Nicole by OPI glitters =-. Absolutely luv 212! I seriously believe ChG’s Medallion is a dupe for WMW. I can’t wait to get AMtH!